Sadly I am ashamed about being a blogger in the blogging industry as it is today. I’m reminded of the SEO industry a few years back, between 2004 and 2009, where the SEO industry attracted a number of questionable characters. Shady SEOs turned to shady tactics to make a buck. For the SEOs back then it was these sketchy persons promising to get you on the first page of Google while behind the scenes building spammy links and using shady PBN (Private Blog Network) to achieve said ranking. This same pattern is happening again but within the blogging sphere. A breed of bloggers with not much results in blogging ethically has surfaced and upon realizing how much actual true hard work it is, have turned to becoming the new cheesy get-rich-quick internet club by doing unethical things. Like the SEO industry not every blogger is a snake oil artist. 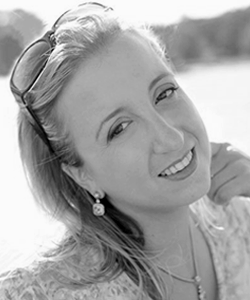 The good SEOs rode the storm out as the bad ones left the industry. The same will happen naturally with blogging as it weeds out the bad, and the ethical bloggers will stay around. Like the SEO industry had to also, the blogging industry on the whole will then have to do damage control to clear up the perception that the unethical ones leave behind. Bloggers can decide now how bad the shake-up will be by which route we take. If the brands or blogging industry doesn’t push for a shake-up and clean the industry up themselves my prediction is Google probably will. The storm of Google would be the worst outcome, so my hope lies with industry officials for leading and example. Stop ignoring the bad, by calling out unethical characters as bad, make it understood that it won’t be tolerated or rewarded. If we take the blind eye approach we can wait for Google to do it and it will not be pretty. Much like when Google was fed up with the faults of the SEO industry, they pushed out a few major algorithms that hurt many websites, some which have yet to recover from shady SEO practices. These particular SEO’s who originally worked on the sites are probably so embarrassed they got highlighted, targeted and executed they left the industry and left their SEO experience off their resumes or are still hiding under a rock . Look at Google’s Penguin algorithm that first came out in April 24, 2012; it targeted spammy link building and became the beginning of an exodus of shady SEO people getting new careers . As you can recall there were numerous sites that got hit hard when they ignored the warning and guidelines because they felt they deserved to be making money over being ethical but Google taught them it is definitely not worth it. A good majority of those websites had to be abandoned or are still fighting to recover their rankings, costing people’s careers and money to rectify the unethics used to game the system back then. History always repeats itself and much like it did in SEO world, the blogging world will survive only by those who actually are ethical and the unethical will end up looking like fools. Those particular persons will be weeded out and will move on to the next new flashy object of the day. 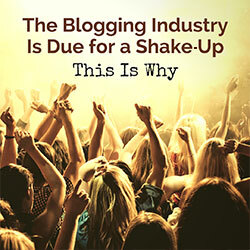 I personally can’t wait for a shake-up to happen in the blogging industry. It is due time and I hope it is around the corner, because it is embarrassing to see what people think is fine to do and don’t feel morally challenged doing so. Much like the the spammy link building and worthless PBN shady SEOs used to get false results; it looked good on the outside but if you look closer with a trained eye you can see the pattern of unethics is the same as in the blogging world. All of these practices are frowned upon and don’t meet FTC Guidelines for Digital Advertising and negatively impact our community. 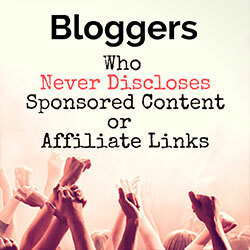 The ones who really need to change and lead by example are the so called blogging mentors and industry influencers who sell blogging courses and ebooks or proudly publishing blogging income reports but not disclosing affiliates links correctly. You know the type; they said they made X amount of dollars and you think it is pretty impressive, but after some research of looking around their blog and you can easily find Amazon Affiliate text links or other affiliate links littered around their blog lacking proper disclosures. anything else listed in the Google Webmaster Guidelines as a no. This opinion piece will probably be criticized, because it is well noted bloggers who are unethical protect each other and it will be easier to squawk how wrong articles like mine are and shoot the messenger. I will probably be chastised much like when I try to bring up this topic in blogging groups and quickly my comment gets deleted and or I become blocked from the group. However at the same time I will get several private messages in my inbox thanking me that someone is publicly pointing out it is time for a shake-up..
Outside of that; happy blogging and look forward to seeing future changes in the industry. 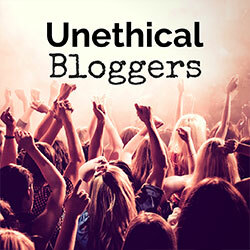 Great post Joanna –its’ these unethical bloggers, driven only by $$ and swag that are already exiting the market. They want a big pay off quick.